The online Upwork job application is available via the company’s careers page (scroll down to learn how to use the careers page/site). Follow the links posted on this page (near the top of the page/in the instructional guide) to go to the company’s employment page. When you open the company’s employment portal you will be able to search for current job openings, register for an online account, and fill out/submit applications for any job openings that you want to apply for. About the Company: Upwork is an American internet-based employment services website based out of California. The company was founded in 2015, and is currently one of the largest freelance jobs website in the world. 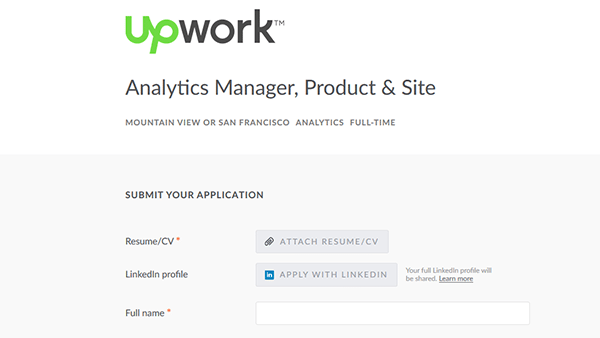 Step 1 – Start by going to the Upwork employment/careers page. Click here to have the site load in a new tab/window in your current internet browser. Step 2 – Click the “See Open Positions” link to be taken to the list of current openings. Step 3 – Press the “Apply” button to go to the next step. Step 4 – Review the job description and then hit the green button (“Apply”) to move to the next part of the application process. Step 6 – Hit the “Submit” button to submit your application/move to the next step.